If you’re the first person awake in your home, then grinding your own coffee might be something that you don’t think that you can do. Though coffee grinders are notoriously loud when in use, we’ve found some good quiet coffee grinders on the market. The models we’ve tested not only perform well, giving you a consistent grind, but they also operate a lower sound level than most other grinders on the market. They key is knowing which of these are the quietest coffee grinders. Fortunately, we can help you out with that as we’ve tested several models to come up with the best options for early risers in need of the most silent coffee grinder for the price. Quick Answer: What Are The Best Quiet Coffee Grinders? Keep in mind that manual grinders are always going to be the absolute quietest option on the market, but the electric grinders we’ve selected are more quiet than other electric models we’ve tested. Hario Ceramic Coffee Mill - "Skerton"
While not appealing to most people, the manual hand grinder coffee mills have the absolute lowest noise levels. Since you have to use good old elbow grease to make this type of grinder work, there is no motor to make those whirring noises that plague other models. In addition to being the quietest, these are also the cheapest quiet coffee grinder type that we’ve tested. If you prefer to save up your strength for other things, then a good burr grinder model is the better choice for you. The obvious disadvantage to this type is that it is usually only the high quality models that are quiet, and they tend to come with a high price tag as well. That being said, we did manage to find some affordable options that should meet most household budgets. Just keep in mind that you do tend to need to spend more for a quiet electric coffee grinder. After checking out all of the top rated coffee grinders on the market, we were able to narrow down the models to just the seven that you see reviewed below. Based on our testing and comparing, these are what our editors recommend for people who need a coffee grinder that is not loud. If you’re not sure which model best meets your coffee drinking needs, keep reading to see what we like and don’t like about each one. Coffee aficionados will appreciate the ease of use and capacity of the Capresso 560.01 Infinity Burr Grinder. The exceptional capacity allows you to grind larger amounts of coffee, up to 8 ½ ounces, to the exact grind that you desire. With 16 different grind settings, you can reach the perfect grind in seconds whether you are looking for a fine grind for Turkish coffee or a something a little coarser. A built in timer allows you to set the perfect grinding time. The design preserves the flavor of coffee by reducing the amount of friction and heat created by the grinding process. The grinder is easily disassembled for easy cleaning. 16 different grind settings allow you to create the perfect grind that you are looking for. The conical steel burrs are a feature that provides the high quality grinding of commercial coffee grinders. Container for beans is see through for better operation. Removable burr can sometimes be difficult to seat properly. It takes some practice to find the grind that is most desirable. Overall, this is an excellent coffee grinder. The size and quality make it an excellent addition to any coffee lovers kitchen. For the true aficionado in pursuit of the ideal cup of coffee, this tool is essential. The capacity allows you to provide a premium coffee experience with a larger group such as at a dinner party or reception. That first cup of coffee can be a special part of your day. Full and rich, it can help you tackles the challenges before you. That is why you need to right equipment to create that special cup of coffee. 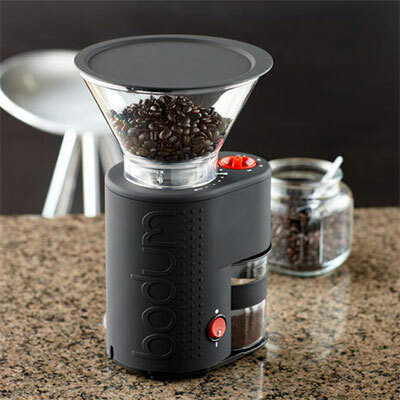 The Bodum Bistro Electric Burr Coffee Grinder has 14 different grind settings so that you can create that special brew. The glass catcher is created from borosilicate. Its antistatic qualities prevent jumping coffee grounds and make it resistant to breakage. The wide range of grind selections ensures that you get the perfect cup of coffee. The no spill lid fits tightly and securely. Grind the exact amount of coffee you need each and every time with the timed grinding feature. The range of available colors ensures that it will match the color scheme of your kitchen. Available colors include black, red, orange, green and white. Bodum provides a two year warranty with proof of purchase on any model that is defective. Makes smaller amounts of coffee each time. Settings can be difficult to change frequently. Grinder requires frequent cleaning to maintain its optimal functioning. The maximum run time is approximately 30 seconds. Some have complained that the plastic gear shifts have broken within a year of operating but these complaints have been few. For the money and the features that are offered by this model, this is a perfect coffee grinder for the discerning coffee connoisseur. It will make the perfect gift for those who enjoy a full, rich coffee experience. In order to make the perfect cup of coffee, you need to be able to grind and weigh the coffee precisely. The beautifully designed Italian Baratza Vario-W 986 is the perfect coffee grinding answer with a real-time weight-based grinder for extreme accuracy. Overall, the Vario-W 986 grinder is carefully designed to create the perfect cup of coffee each time. It is a professional grade grinder without the price and designed to be durable to grind for years to come. Some things you may want to consider. The verdict is the Baratza Vario-W 986 is a great coffee grinder for the money. It may be a little louder and is not equipped to manage large grinding orders or excessive use without adjustments, but for personal and office use, it will make the same perfect cup of coffee each time for you. To get the best flavor out of your coffee, you need to grind your own beans. And this KRUPS model makes that an easy and quiet process. 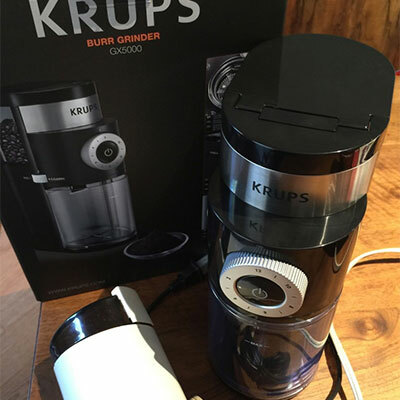 The KRUPS GX5000 Professional Burr Grinder is one that will allow you to grind either a cup or a whole pot at once, and is used in restaurants as well as in homes. It will hold eight ounces of beans, and has a lot of setting to allow you to get just the grind you want. Clear bean container allows you to see what you have left easily. Nine grind levels, and with all the settings, you have about 40 choices you can make, from coarse coffee to espresso. 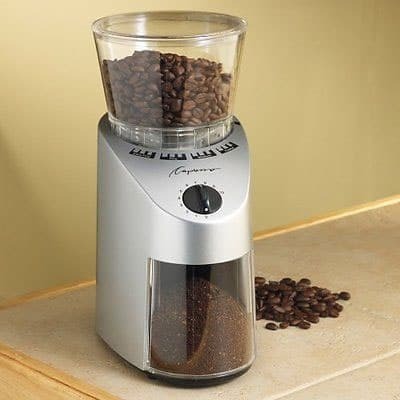 It has a blat metallic, burr mill grinder that helps avoid overheating. Safety features include stopping automatically when quantity you want is ground, and will not work unless lid of hopper is fastened. Relatively small at 10.4 inches tall, 4.29 inches wide and 7 inches deep. Removable coffee container with lid, that preserves freshness. It will grind some other items, but not many. This is almost strictly a coffee grinder. Some report that it creates a lot of coffee dust, which is to be expected, but that does make keeping it clean an issue. Some also report the settings are not that different. It’s design makes it a little hard to clean as well. Overall this is a good coffee grinder. It seems well made and durable. Setting may not be as versatile a claimed, but if you adjust the timing manually, you can get the grind you want. It is a good price for a coffee grinder, and while it may not be as versatile as some, it is great for making coffee and will last a long time. Coffee grinders are becoming a popular way to prepare gourmet coffee, and the Baratza Virtuoso – Conical Burr Coffee Grinder is a popular option for many people. And for good reason – it works well and does so quietly. Highly reviewed by our editors, it is worth understanding what works with this model and what doesn’t. Easy to store size – With dimensions that fall well under six inches, this grinder is easy to store when not in use and takes up little room on your shelves when it is in use. Smooth and efficient grinds – The high-powered motor (which tops 450 RPM) produces a very consistent and fine grain coffee. Looks great – For the coffee grinding fan who wants a fashionable grinder, the Virtuoso is a great choice. It’s exterior is graced with metal decorations that give it a high-priced style. Versatility – From the 60 second grinder timer to various other options (including coffee potency), there are plenty of great grinding options with the Virtuoso. The price – While definitely a great investment for any serious coffee fan, it is a little more expensive than some grinders, which may make it harder to justify purchasing it. No hand-grind option – The power of the Virtuoso makes it great for those who don’t want to grind themselves, but a hand-grind option would have been nice for those who like to work a little. Bulky and heavy – With a weight that tops almost eight pounds, the Virtuoso lacks the easy portability of other models, making it a strictly home-based grinder. So who would benefit most from the Virtuoso? Anyone who wants a powerful grinder that generates a nice output of coffee. Those who want to work a little for their coffee or who simply like hand-grinding should try a different model. For many people, coffee is an absolute necessity before starting the day. As a result, high quality gourmet coffee has become extremely popular, especially for those that want to grind their own. If you don’t have time to grind three pounds of coffee in the morning, the Hario MSS-1B Mini Coffee Mill Slim Grinder is a good choice. There is a lot to like about this simple hand-held coffee mill. Portable size – With a height under eight inches and a width just above four inches, it is easy to take and store just about anywhere. Simple clean design – Remove the handle and the grinder, run both under water, rub the surface of the grinder with a rag, and your grinder is clean. Built with ceramic material – Unlike metal grinders, which can rust over time, this ceramic grinder is rust-resistant, making it a great choice for anyone who plans on using it regularly. As you can see, there are many advantages to this little grinder. However, like all things in life, it isn’t perfect. Unfortunately, there are a few things about it that just don’t quite work for our taste. Hand-grinding action – While some buyers may like grinding every cup of coffee by hand, a power option would have been nice for those who have difficulty with the handle. Small output – The Hario MSS-1B Mini Coffee Mill Slim Grinder has enough room to grind one or two cups of coffee. This works for people who only need one or two in a day, but adds extra work to those who go through a pot a day. Top heavy – Though tipping doesn’t seem to be a problem with this model, its top heavy nature may make dangerous spills a real possibility. Weighing its advantages and disadvantages, we think that this particular model is perfect for the gourmet coffee fan that needs one or two cups at the beginning of the day and who doesn’t mind a little extra work in the morning. Those who are less discriminate about their coffee or who need more should try a different grinder. Grind your coffee beans anytime and anywhere with this super-light and portable coffee grinder by Hario. You don’t need to be dependent on an electrical outlet to get your grind on either, with its convenient turning handle that gets your beans down to your desired consistency without a noisy motor. This one has more capacity than the slim model above, which makes it a great choice for couples or java junkies who enjoy more than one cuppa in the morning. Because it’s manual, you will be in complete control about how fine or coarse you want your coffee grounds. Great for anyone who needs an affordable or second coffee grinder. Its small size makes it great for traveling. The set comes with a base for a stable grinding surface. You will also appreciate how the Hario Ceramic Coffee Mill Skerton grinds beans evenly so that your coffee tastes very fresh every morning. Fill your home with the aroma of freshly coffee grounds that have not been sitting in a bag losing their potency and taste. Since this grinder is easy to clean, coffee grounds don’t get stuck and grow stale either, preserving the taste of your coffee every time. It takes some strength and effort to grind the coffee beans manually. It will take longer to grind your coffee beans finely because the machine is not electric. Weighing all these attributes, we conclude that the Hario Ceramic Coffee Mill Skerton is an excellent addition to anyone’s kitchen or travel bag. It is a great value that comes with high versatility and convenience, which appeals to any coffee enthusiast. Previous Post: « Finding Your First Cup of Authentic Kona Coffee! I prefer to vote for Baratza Virtuoso, a great conical burr coffee grinder beneath $250 as you mention. You will get it from amazon using the price range. Conical burr is best for grinding coffee bean along with the most significant is that you discover your right coffee grinder. All grinders can’t supply all form of grind settings..so from this point as you mention your spending budget Baratza Virtuoso will probably be the best I believe. I wonder how difficult the manual options are to use? I really like the idea of them, but I’m just not sure how much strength it takes or if I want to have to deal with that each morning. The hubby will be so happy when one of these arrives! I get up almost two hours before him and I know my morning coffee routine messes with his sleep.